With her busy life and career, Preeti yearned to have a quiet little corner of her house to calm our minds. A beautiful balcony garden to warm the heart and soothe her soul is all that she wanted. Preeti was a firm believer of the Chinese proverb that goes like, “If you want to be happy for a lifetime, be a gardener”. She always admired people with a garden in their homes and wished to experience the same pleasure of nurturing saplings into beautiful plants, blooming with colourful flowers and juicy fruits. A lot of people think that to have a garden, you need a sprawling yard. Due to urbanisation, the new generation mostly lives in apartments and do not always have that luxury. Many such apartments have limited spaces, which can make even indoor decoration a challenge. So, having a yard is a distant dream for many home-owners in the city. If you are living in an apartment and wish to have a garden too, just like Preeti, do not give up so soon! You can easily create a beautiful garden of your own, right on your balcony, with some planning and proper decor ideas. A balcony garden can be beautiful, like a gorgeous crown on your house. 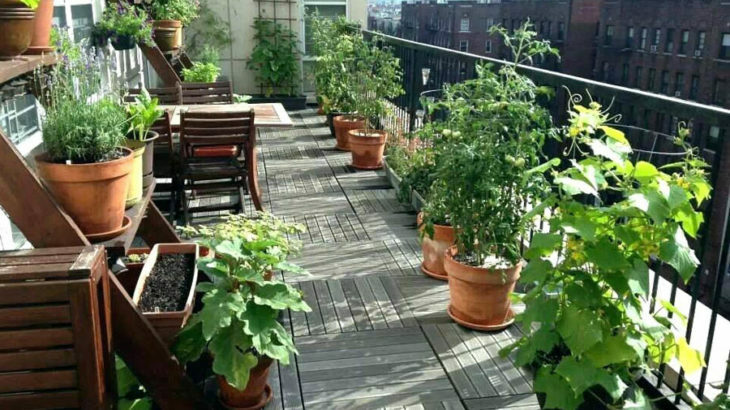 Let us give you some awesome ideas to create a beautiful balcony garden. As a first step, learn about how much space you have to work with. Also, you have to be sure that your balcony will be able to hold the weight of the clay pots, earth, and water. Before you start planting, get some knowledge about the requirements of the plants according to the weather condition of your region. Some plants need 6 to 8 hours of sunlight to grow, while some can hardly stand four hours of sun. If you have a small balcony, it will be smart to combine the plants. For example, plants with large leaves and needing more sunlight can be planted beside saplings that need some shade. Climbers and legumes can be added to increase the nitrogen of the soil. You can also plant some organic herbs at a separate corner to add them to your food or just for the sweet aroma. The railings of your balcony can be adorned by hanging up planters on them. You can use ceramic pots, clay pots, plastic pots or self-made wooden planters to set up colourful flowering plants and creepers. Planters can be suspended from the ceiling of your balcony too. Wicker baskets and terracotta pots can look really beautiful when hung from sturdy hooks and metal rods. As a safety measure, be careful to verify both the railing and the ceiling are strong enough to carry the weight of the pots. To relax amidst nature, arrange some seating for your balcony. You can go for wicker chairs, a small centre table, and some colourful stools. Throw in some cushions to cosy-up the place. If you have some extra space, you can add a hammock as well! Any decor is incomplete without lighting. So, light up your balcony garden with soothing chandeliers, paper lanterns, and beautiful fairy lights. Make your balcony garden livelier with the chirping of birds. Get some bird feeders to invite your feathered guests! You can buy ready-made bird feeders or can make one yourself. A bird bath will also be a welcoming addition for the chirpy fellows. The adjoining wall of your balcony can be utilised by adding some extra planters. You can find different types of wall planters online or look for some DIY ideas. If your balcony is adjacent to the windows, beautiful window boxes made of terracotta or other natural materials can be used to plant some herbs, veggies or pretty flowers. Leave some personal touches to your balcony garden by painting it in your favourite hues, adding graffiti and quotes. You can add a faux grass carpet to make the ambience earthier or a colourful rug to spruce up the place. Seek out more creative ideas to build your garden. Though you have to settle for the lesser space, you do not have to compromise with your visions. Get some gardening tools, colourful storage containers and quirky decor pieces to make it your own little paradise. Green living is very much in vogue now as it is extremely important for the urbanites to relax in the company of nature. 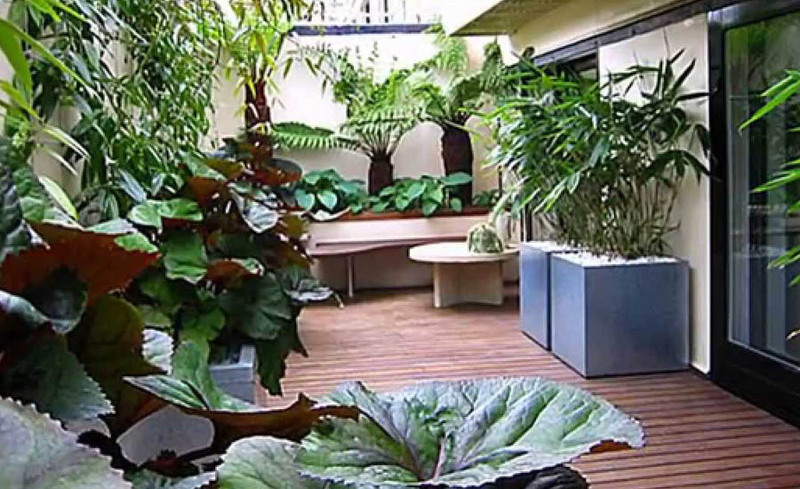 A balcony garden can be a great start to live with a touch of greens right in your balcony.